Jinfengopteryx (from Jinfeng, 'golden phoenix', the queen of birds in Chinese folklore, and Ancient Greek πτερυξ pteryx, meaning 'feather') is a genus of maniraptoran dinosaur. It was found in the Qiaotou member of the Huajiying Formation of Hebei Province, China, and is therefore of uncertain age. The Qiaotou Member may correlate with the more well-known Early Cretaceous Yixian Formation, and so probably dates to around 122 Ma ago. Jinfengopteryx is known from one specimen (number CAGS-IG-04-0801), a nearly complete articulated skeleton, which measured 55 cm (2 ft) long. It was preserved with extensive impressions of pennaceous feathers, but it lacks flight feathers on its hind legs, which are present in related dinosaurs such as Pedopenna or Anchiornis. It also preserves several small, oval structures that are reddish yellow in color, probably seeds that the dinosaur had eaten before it died. The diet is unsure. Despite being a theropod, it could have been a herbivore. The authors of the original description considered Jinfengopteryx to be the most basal avialan (bird), and a member of the family Archaeopterygidae. In a 2007 follow-up paper, they went on to compare Jinfengopteryx and Archaeopteryx, still supporting its placement as an archaeopterygid, but providing no phylogenetic analysis. However, Luis Chiappe pointed out that Jinfengopteryx appears to have more in common with the troodontids, such as an enlarged claw on its short second toe, and that numerous scientists suspect it may belong to that group. In 2006, Xu and Norell also suggested that Jinfengopteryx was a troodontid, based on general body plan and features of the teeth. In a 2007 analysis of the relationships between troodontids, dromaeosaurids, and early birds, Turner and colleagues did find Jinfengopteryx to be a troodontid, and referred it to that group, noting that it is the first troodontid specimen to preserve evidence of feathers. In 2012, Turner and colleagues erected a new subfamily called Jinfengopteryginae. The unique features of that subfamily include the big antorbital fenstra and the bifurcated jugal. The specimen IGM 100/1126 (currently without an assigned genus) is the closest relative of Jinfengopteryx within the group. ^ Jin Fan; Zhang FuCheng; Li ZhiHeng; Zhang JiangYong; Li Chun; Zhou ZhongHe (2008). "On the horizon of Protopteryx and the early vertebrate fossil assemblages of the Jehol Biota". Chinese Science Bulletin. 53 (18): 2820–2827. doi:10.1007/s11434-008-0209-5. ^ a b Ji Qiang; Ji Shu'an; Lu Junchang; You Hailu; Chen Wen; Liu Yongqing; Liu Yanxue (2005). "First avialian bird from China (Jinfengopteryx elegans gen. et sp. nov.)". Geological Bulletin of China. 24 (3): 197–205. ^ Zanno, Lindsay E.; Gillette, David D.; Albright, L. Barry; Titus, Alan L. (2009). "A new North American therizinosaurid and the role of herbivory in 'predatory' dinosaur evolution". Proc. R. Soc. B. 276 (276): 3505–11. doi:10.1098/rspb.2009.1029. PMC 2817200. PMID 19605396. ^ Ji S., and Ji, Q. (2007). "Jinfengopteryx compared to Archaeopteryx, with comments on the mosaic evolution of long-tailed avialan birds." Acta Geologica Sinica (English Edition), 81(3): 337-343. ^ Chiappe, L.M. Glorified Dinosaurs: The Origin and Early Evolution of Birds. Sydney: UNSW Press. ^ Xu and Norell (2006). "Non-avian dinosaur fossils from the Lower Cretaceous Jehol Group of western Liaoning, China." Geological Journal, 41(3-4): 419-437. ^ Turner, Alan H.; Pol, Diego; Clarke, Julia A.; Erickson, Gregory M.; Norell, Mark (2007). "A basal dromaeosaurid and size evolution preceding avian flight" (PDF). Science. 317 (5843): 1378–1381. doi:10.1126/science.1144066. PMID 17823350. ^ Turner, Alan H.; Makovicky and Norell (2012). "A review of dromaeosaurid systematics and paravian phylogeny" (pdf). Bulletin of the American Museum of Natural History. 317: 1–206. doi:10.1206/748.1. ^ Cau, Andrea; Brougham, Tom; Naish, Darren (2015). "The phylogenetic affinities of the bizarre Late Cretaceous Romanian theropod Balaur bondoc(Dinosauria, Maniraptora): Dromaeosaurid or flightless bird?". PeerJ. 3: e1032. doi:10.7717/peerj.1032. PMC 4476167. PMID 26157616. 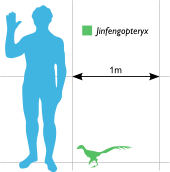 Discussion of the affinities of Jinfengopteryx, from the Dinosaur Mailing List. This page was last edited on 14 March 2019, at 06:37 (UTC).